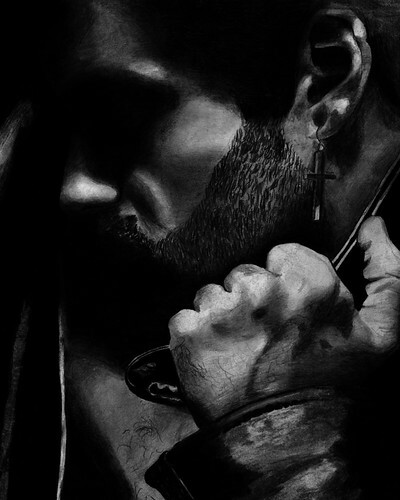 As with my previous portrait pencil illustrations, Kate Bush, Hannibal Lectar and Elvis Presely, this one of George Michael was copied from a photo, in this case, a record sleeve (yes, not CD, a record) from the “Faith” album. I loved the general moodiness and darkness of this portrait, but translating that level of darkness and shadow into pencil can sometime be a bit tricky. The challenging part of this illustration was the eye area. Creating it so that you could imagine the eye being in there, and allowing the mind to actually see it, when it’s not actually there. I know it should be there obviously, because that is where eye’s usually go, but in terms of filling in the pieces. So the surrounding features had to be reproduced almost ‘identically’ to the photo to pull it off. I did have to go through more than several tries to get it looking right. Patience as always is somewhat of a virtue when drawing. As with the other illustrations, a combination of charcoal, Indian ink and the full range of pencil weights were used to pull this one off.